Summer is coming! To get ready for it, I have been stocking on some fab products to protect me from the sun’s harmful rays, and to sooth my skin afterwards. I have received so many great products for my honest review, that I’ve had to split this up into two long posts. I hope this gives you some great ideas! Supergoop! City Sunscreen Serum ($42; travel size $20) – City Sunscreen Serum is a multitasking broad spectrum SPF 30+ daily repair serum for skin exposed to the sun, both in the past and the present. 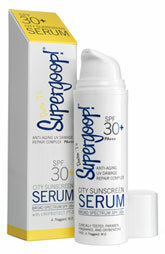 This ultra-light, Broad Spectrum SPF 30+ simultaneously protects skin, moisturizes on contact and combats premature aging. with Antioxidants E and B5 to optimize skin health, promote nutrient absorption and cell renewal and HYDROVOTIN 24 to simulate the skin’s natural moisturizing factor for hydrated and moisturized skin without a rich cream or thick lotion. The perfect first step SPF primer, post cleansing. What I think: This is the first serum with SPF I have tried. It is a very lightweight serum that soaks right into the skin. I love that it gives anti-aging skin care benefits plus the SPF of 30. Kate Somerville Daily Deflector Waterlight ($48 USD) — This ultra-fluid, waterlight sunscreen—that blends effortlessly into skin—provides hydration, SPF50+ broad spectrum protection, and anti-aging benefits. A cutting-edge delivery system ensures that the Sunscreen stays in a reservoir on the skin’s surface, while Advanced Ingredients penetrate to restore optimal moisture levels and reduce the appearance of wrinkles. What I think: This is a wonderful sunscreen that is so light you can use it over a heavier moisturizer if you need one. It also has great anti-aging benefits. Great if you are looking for a sunscreen to use with your normal skin care regimen. Naturals Skincare Sheer Zinc Moisturizer Broad Spectrum SPF 30 by Peter Lamas ($44 USD) -offers the ultimate sun protection, this lightweight moisturizer is packed with powerful antioxidant-rich ingredients that help nourish and protect complexion from sun damage. A synergy of active ingredients, which includes natural Mineral Sunscreen Zinc Oxide, defends against free radicals and hydrates the skin while Grape Stem Cells help increase cell turnover rate to rejuvenate skin and repair damage caused over time by harmful UV rays. Zinc Oxide creates an invisible barrier against the sun to provide broad spectrum protection against both UVA and UVB rays, while photosomes help reverse UV-induced damage and help repair the skin’s DNA. Olive leaf extract—loaded with polyunsaturated acids—maintains moisture to help create a supple, more youthful-looking complexion. What I think: I have been using this for a couple of weeks now. I love the SPF, but since it contains Zinc in it, you need to blend it well so white residue doesn’t appear on the skin. I also like to let it sink in for a few minutes before I apply my makeup. Coming in June to PeterLamas.com. Laura Mercier Tinted Moisturizer SPF 20 ($42 USD) – Many women prefer a light foundation when lounging by the pool or on a beach, as anything too heavy tends to melt away. Laura Mercier Tinted Moisturizer SPF 20 offers sheer coverage, light moisturization and sun protection-! Toss this 3-in-1 multi-tasker in your beach bag to achieve the perfect dewy glow. What I think: I have heard great things about this moisturizer, and I was not disappointed. This is so moisturizing that you can skip your normal moisturizer if you wish and apply it right over serum. It covers well, but is light enough to look natural. Available in two shades: Fair/Light and Medium/Dark. What I think: This is the lightest BB Cream I have used. It is very moisturizing, but the coverage isn’t for those who want full coverage. It you want to wake up in the morning and just put this on, you will look very natural and receive skin care benefits. Available at drugstores and mass-market retailers near you. 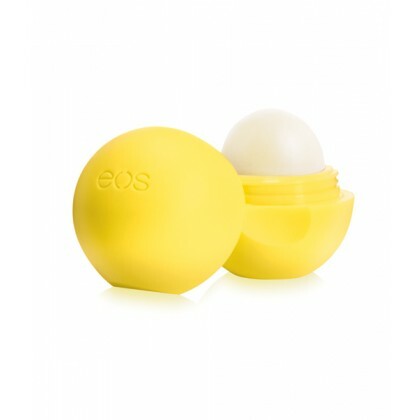 eos Smooth Sphere Lip Balm in Lemon Drop with SPF 15 ($3.29 USD) – Pamper your lips while you protect them from the sun with this irresistibly refreshing Broad Spectrum SPF 15 lip balm that’s bursting with natural flavor. What I think: I love eos lip balms. These are fun and very moisturizing. They also taste great. This one is perfect for the summer since it has SPF. Available at www.evolutionofsmooth.com and your local drugstore.